Get priceless advice, become a successful designer and make money online. You are a designer probably because you are passionate about art, design and technology. But are you also an in-demand designer overloaded with projects? When you start out as a designer, you also start out as a salesman. But selling does not come naturally to creative minds. That is where today's ebook is a boon. It will give you valuable advice to take your career to newer heights. This eBook provides you with valuable advice from experienced & in-demand designers. It reveals the secrets you need to know for a successful design career. What you can expect from this guide? 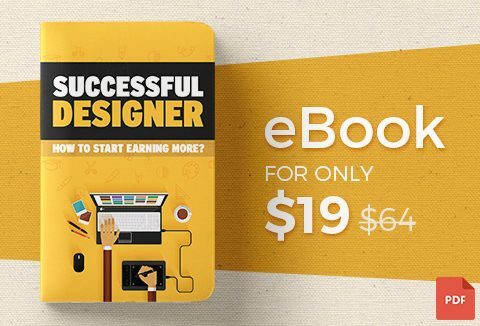 The main goal of this eBook is to make you a profitable designer. No matter on what level you are at the moment. If you want to enhance your productivity, manage freelancing like a pro, explore ways of self-development and learn how to create an impressive portfolio – this eBook is right for you! It is more like a textbook or a training course that has one goal – to make you a successful and in-demand designer. Get some practical advice, handpicked from lots of different sources and different designers. He is a creative designer from southern Ukraine. And a successful top rated upWork designer with over 7 years of experience. He enjoys creating pretty cool solutions for web and mobile apps. He loves to collect, explore and share his first-hand tips on how to become a successful freelance designer. What are you waiting for? Get it and give your design career a boost right away!